SAC (Single Assignment C) is a strict purely functional programming language whose design is focussed on the needs of numerical applications. Particular emphasis is laid on efficient support for array processing. Efficiency concerns are essentially twofold. On the one hand, efficiency in program development is to be improved by the opportunity to specify array operations on a high level of abstraction. On the other hand, efficiency in program execution, i.e. the runtime performance of programs both in time and memory consumption, is still to be achieved by sophisticated compilation schemes. Only as far as the latter succeeds, the high-level style of specifications can actually be called useful. In order to facilitate the compilation to efficiently executable code, certain functional language features which are not considered essential for numerical applications, e.g. higher-order functions, polymorphism, or lazy evaluation, are not (yet) supported by SAC. These may be found in general-purpose functional languages, e.g. Haskell, Clean, Miranda, or ML. In order to overcome the acceptance problems encountered by other functional or array based languages intended for numerical / array intensive applications, e.g. Sisal, Nesl, Nial, APL, J, or K, particular regard is paid to ease the transition from a C / Fortran like programming environment to SAC. to provide high-level array operations that liberate programming from tedious and error-prone specifications of starts, stops and strides for array traversals thereby improving code reusability and programming productivity, in general. to facilitate the compilation for non-sequential program execution in multiprocessor environments. 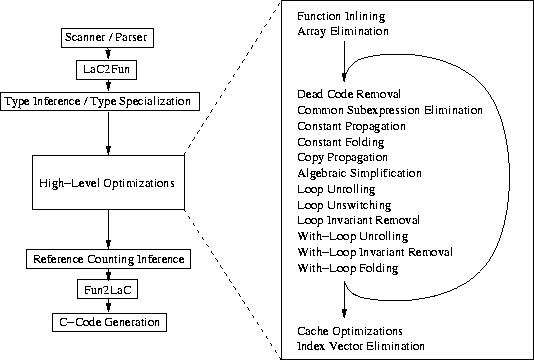 implicit support for non-sequential program execution on multiprocessor systems. However, C is used as an intermediate language in order to achieve portability among different target architectures and to reuse existing compiler technology for the generation of machine specific code. The following graphic illustrates the major compilation phases of sac2c. Most of the intermediate phases operate on a code representation that is based on static single assignment form (SSA). To achieve this two additional phases called Fun2LaC and LaC2Fun transform intermediate SAC code into this convenient format and vice versa. For example, front-end representations of loops and if-clauses are transformed to what they actually represent: tail-end recursive functions and functional conditionals. Several case studies investigate the suitability of SAC for implementing numerical application programs is investigated with respect to both programming elegance and runtime performance of compiled code, in particular with respect to shared memory multiprocessors.